Spend a day making a this sublime A5 journal. 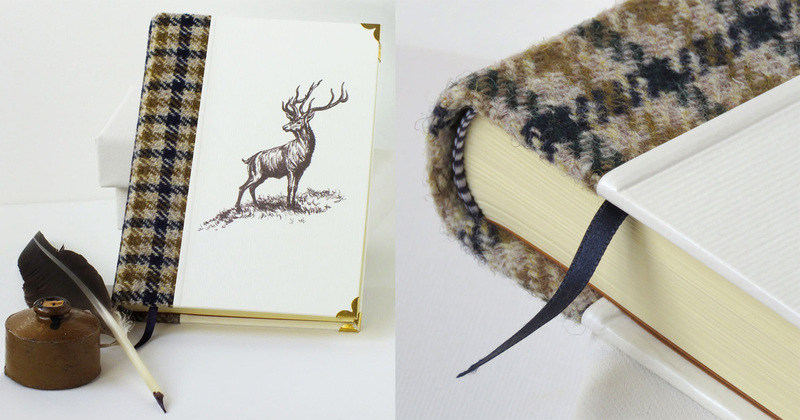 It is quarter-bound in a selection of genuine Harris Tweeds and features a natural history engraving of your choice. This is a book to treasure, with 400 pages of buttery smooth, quality paper, silk headband, velvet bookmarker and metal corners. If you have already attended the Introduction to Bookbinding workshop and would love to take your skills to the next level, this is the workshop for you! However, no bookbinding experience is necessary, if you’re confident in your crafting ability you’ll have no problem creating this beautiful journal.